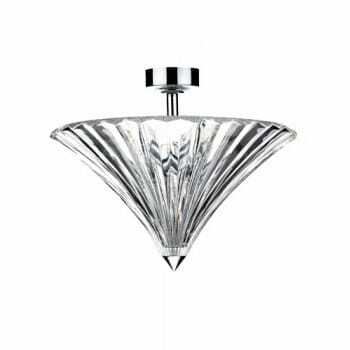 Dar Lighting Ardeche 3 light semi flush ceiling fitting features an elegantly fluted, clear glass shade with a polished chrome stem and ceiling plate. The product code for this Dar ceiling fitting is ARD5350. A decorative item that will enhance classic decors and add an art decor look to any modern o traditional styled decor within your home, can be used with a dimmer switch to create atmospheric lighting. The Ardeche is also available as a pendant version, which can be viewed on our website.